Blue, red and yellow are traditional colours of service battalions. 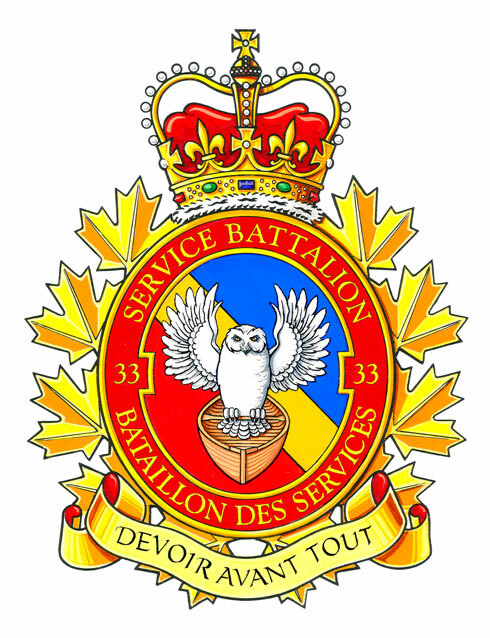 The snowy owl is taken from the badge of the former 26 Service Battalion which was amalgamated with the 28 Service Battalion into this new Service Battalion. The canoe was used as a historical means of transportation and supply in the areas of eastern and northern Ontario in which the battalion is located. The motto was that of the 28 Service Battalion. This French phrase means “Duty above all”.